Lifting anything heavy takes a lot out of you. This is the reason why we're fond of machines that amplify our physical abilities. One of the best machines that increases our lifting capacity can be found at home, or more specifically, in the garage. The garage door opener uses its gears, chains and belts in conjunction with the garage door springs to lift heavy doors with ease. Springs are essential to the proper functioning of openers. Openers are capable of generating a lot of power but they are designed to work together with the springs that are already carrying the weight of the door. 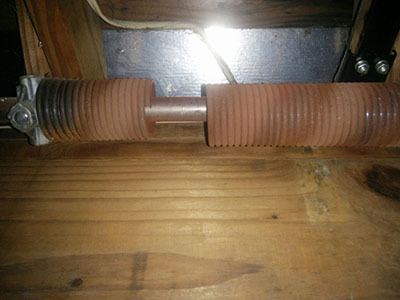 The two kinds of garage door springs that you can find in a garage are the torsion and extension springs. If you look up your doorway and find a big spring in the middle of a mounted shaft, then you have the torsion spring setup. This type of spring is so powerful that even just one could carry the entire weight of a heavy door. The other type of spring is the extension spring. You won't see them overhead, instead, they're situated to the sides of the door. They're much smaller and more flexible, hence a pair or two are usually installed to generate enough force to lift the door up or to ease it back down. Your garage door springs are very durable. They have to be, because they bear a lot of weight every time you open the door. These add up, especially when you're not too particular about maintaining them. Replacing them is inevitable but it could take several years before wear and tear would get to them. What is more likely to happen is that your torsion spring would need to be adjusted or your extension springs would have to be replaced because of safety concerns regarding how securely mounted they are in place. You can also choose to have your extension springs replaced by a torsion spring if you prefer. You can call us up at Garage Door Repair Galveston and we'll provide the professional service you need. We repair doors and openers of all brands, makes and types. Call today!